LAS VEGAS, Nev. (Jan. 19, 2019)–When golfers are looking around for their next spot to tee it up, there are many parameters to consider. Is it affordable? Is it close to home? Is it a layout I’ll enjoy playing? Are there incentives for me to be a return customer? 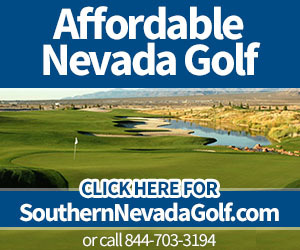 At Las Vegas National Golf Club, the answers are: check, check, check and check, and the local loyal membership players card program offers free rounds and ongoing discounts and deals. –By Bill Bowman, Las Vegas Golf Insider staff. Las Vegas National Golf Club is one of Las Vegas’ original layouts, opening back in 1961. The course was designed by Bert Stamps and is a par-71 layout. This oasis-style course takes players back to the good ole days of Vegas and with a budget-friendly price tag to boot. The 2019 Las Vegas Golf Players Card, available for just $99, gives players two free rounds of golf right off the top. Add in great rates year-round, discounted rates for guests, a free round on the card holder’s birthday as well as discounts in the pro shop and restaurant and you’ve got a great deal. But, there’s a little more. After card holders tee it up for 10 rounds, the 11th round is free. 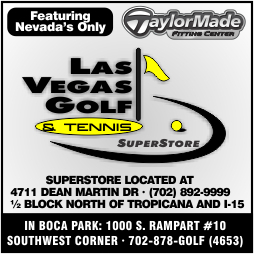 Call 702-734-1796 now for more information or visit the pro shop to sign up. 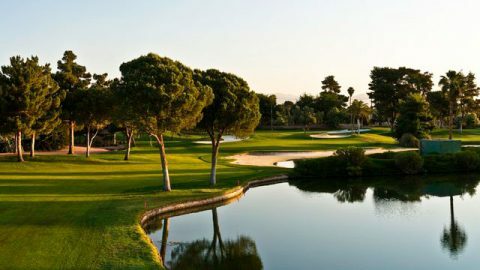 Las Vegas National is framed by hundreds of mature trees. Add deep-blue water features accenting several fairways and greens and risk/reward holes and you’ve got a course that will test every club in the bag. The course is also home to some of Vegas’ most scenic and challenging par 3s. Three play more than 200 yards from the tips and pin-point accuracy will test players’ club selection and nerves. In the clubhouse is the official Las Vegas Golf Hall of Fame exhibit. Las Vegas National also offers the Golfboards so you can surf the earth during a round. While the player’s card is for locals, Las Vegas National offers rates for visitors as low as $79 for 18 holes and a 9-hole rate of $49.